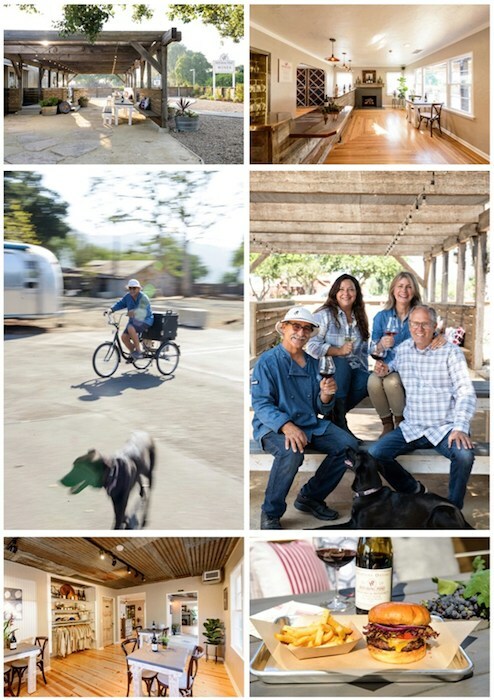 Located right next door to the famed Hitching Post 2 restaurant in Buellton (which was so memorably immortalized in the movie Sideways), Hitching Post Wines recently opened its first-ever tasting room, after almost 40 years of winemaking. Photo by Leslie Dinaberg. The spacious, nearly 12-acre property, formerly occupied by Loring Wine Company, belongs to Frank and Jami Ostini and Gray and Charlotte Hartley. 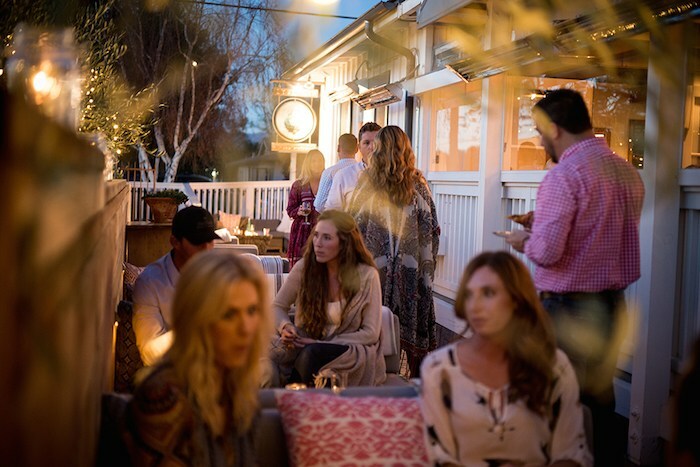 The new tasting room is housed in a mid-century farmhouse with trailing walkways and outdoor seating areas with a view of the Santa Ynez Mountain landscape—including the Ostrich Farm next door. Throughout the property are walkways and casual picnic areas that invite guests to linger over a bottle of wine while taking in the dramatic landscape. Dogs are welcome, too. Longtime friends, Gray Hartley and Frank Ostini have been making wines in Santa Barbara County since 1979. With Pinot Noir as their primary focus, the winery produces about 17,000 cases a year. Top Row: Hitching Post Wines Exterior, Hitching Post Wines Interior. Middle: Frank Ostini and Olive deliver lunch; l-r Frank Ostini, Jami Ostini, Charlotte Hartley and Gray Hartley. Bottom: Hitching Post Wines Interior, the Hitching Post Burger and Triple Fried Fries. Photos by Rob Stark, courtesy Hitching Post Wine. 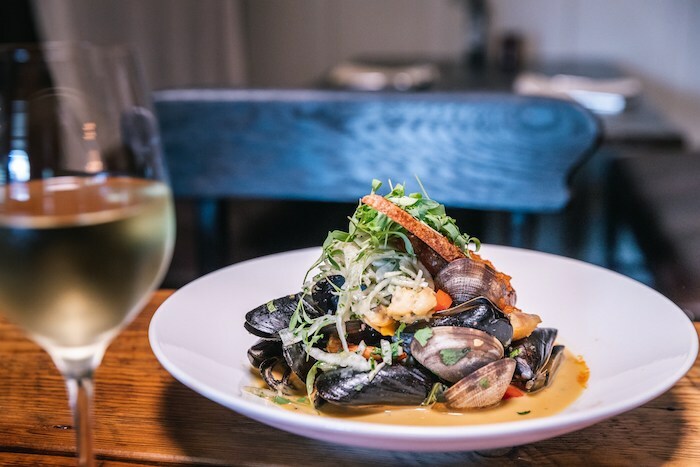 You know the saying, “location, location, location?” Well, sometimes it takes a while for the right one to become available—but in the case of Hitching Post Wines‘ long-awaited tasting room, it was well worth the wait! Located right next door to the famed Hitching Post 2 restaurant in Buellton (which was so memorably immortalized in the movie Sideways), Hitching Post Wines just opened their first-ever tasting room, after almost 40 years of winemaking. The spacious new nearly 12-acre property, formerly occupied by Loring Wine Company, belongs to Frank and Jami Ostini and Gray and Charlotte Hartley. 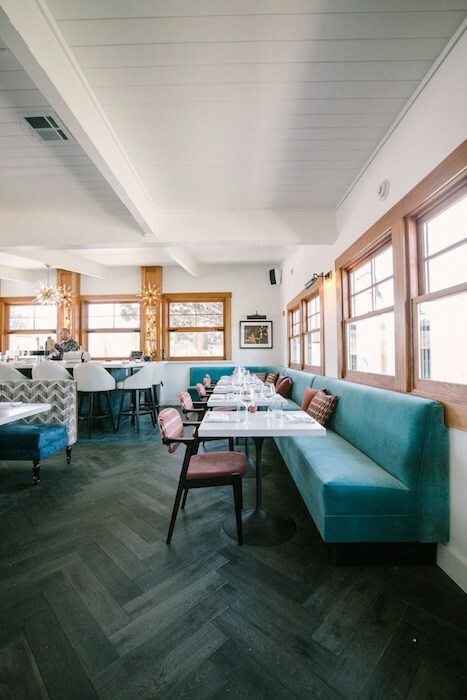 The new tasting room is housed in a mid-century farmhouse with trailing walkways and outdoor seating areas with a view of the Santa Ynez Mountain landscape—including the Ostrich Farm next door. Throughout the property are walkways and casual picnic areas that invite guests to linger over a bottle of wine while taking in the dramatic landscape. Dogs are welcome too. Bottles on display at the Hitching Post Wine Tasting Room, photo by Leslie Dinaberg. Longtime friends, Gray Hartley and Frank Ostini have been making wines in Santa Barbara County since 1979. 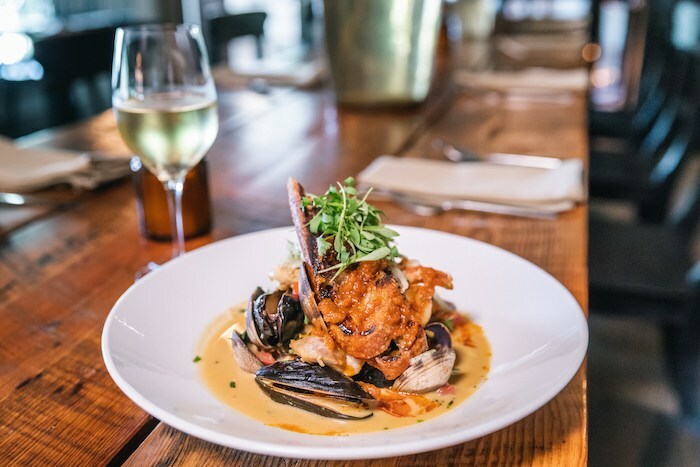 Hartley, a former Alaskan salmon fisherman and Ostini, chef and owner of the Hitching Post 2 Restaurant, came together through their love of wine and winemaking. 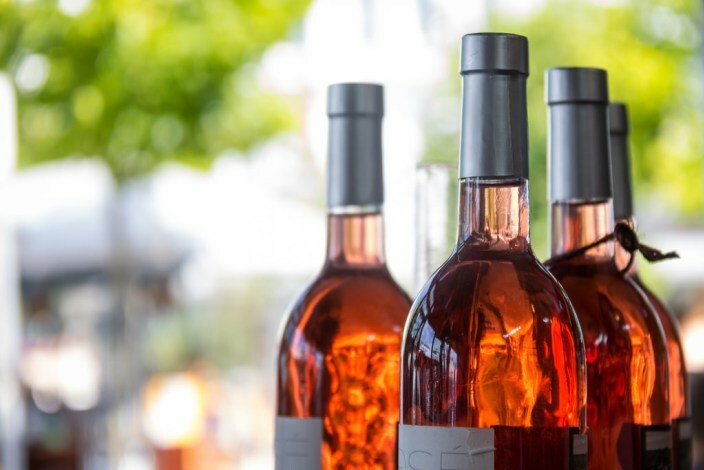 Over the years what was once their backyard hobby has turned into a highly acclaimed winemaking venture, with Pinot Noir as their primary focus. 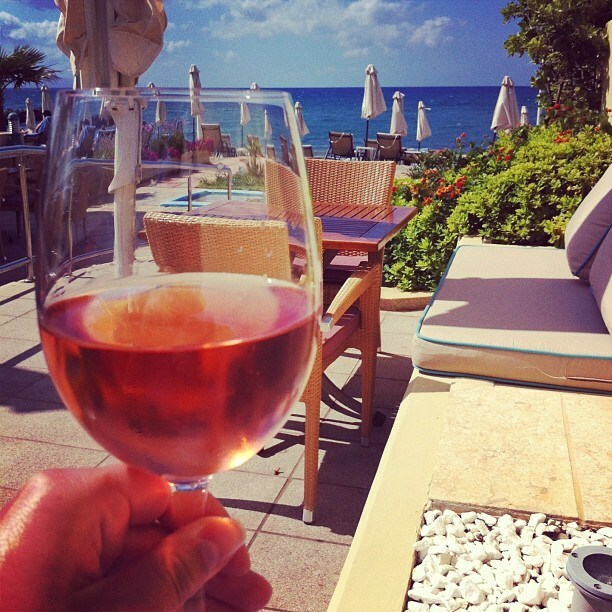 Currently, the winery produces about 17,000 cases a year. 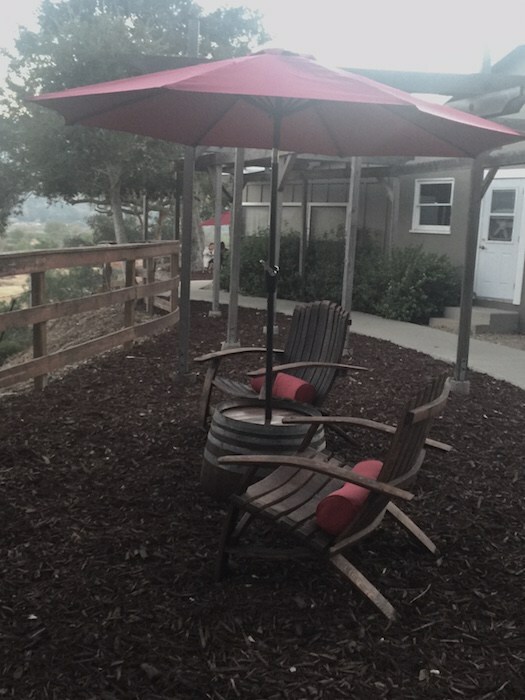 Outdoor seating at the Hitching Post Wine Tasting Room, photo by Leslie Dinaberg. 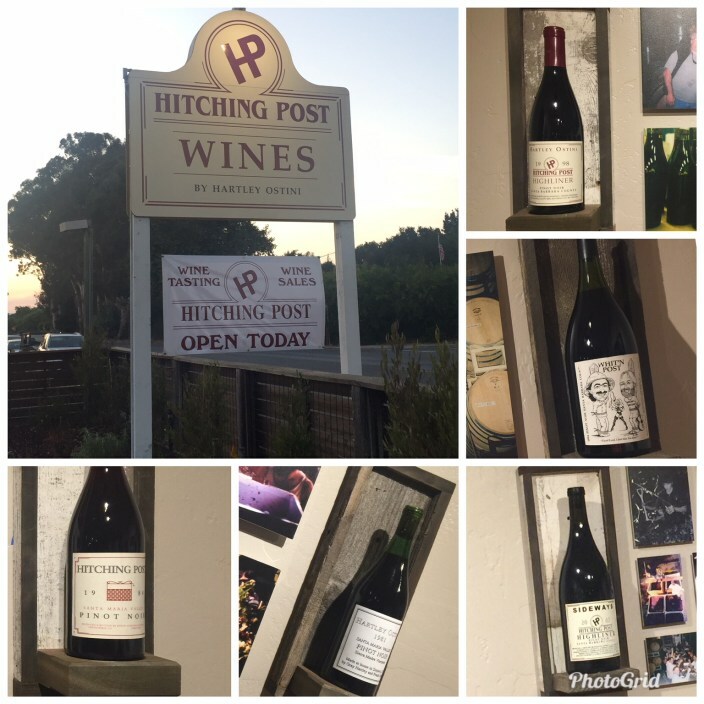 The Traditional Tasting at Hitching Post Wines offers a flight of five Hitching Post Wines consisting of Pinks 2017, Hometown Pinot Noir 2016, Cork Dancer Pinot Noir 2015, Santa Maria Valley Pinot Noir 2015 and Gen Red 2016, priced at $15 per guest. A Reserve Tasting, priced at $20, includes five wines—Highliner Pinot Noir 2015, Perfect Set Pinot Noir 2015, Bien Nacido Pinot Noir 2015, Sanford & Benedict Pinot Noir 2015 and Four Top 2012. The caveat of the Reserve Tasting will be its ever-changing menu featuring rare single-vineyard bottling and special older vintages of Hitching Post. 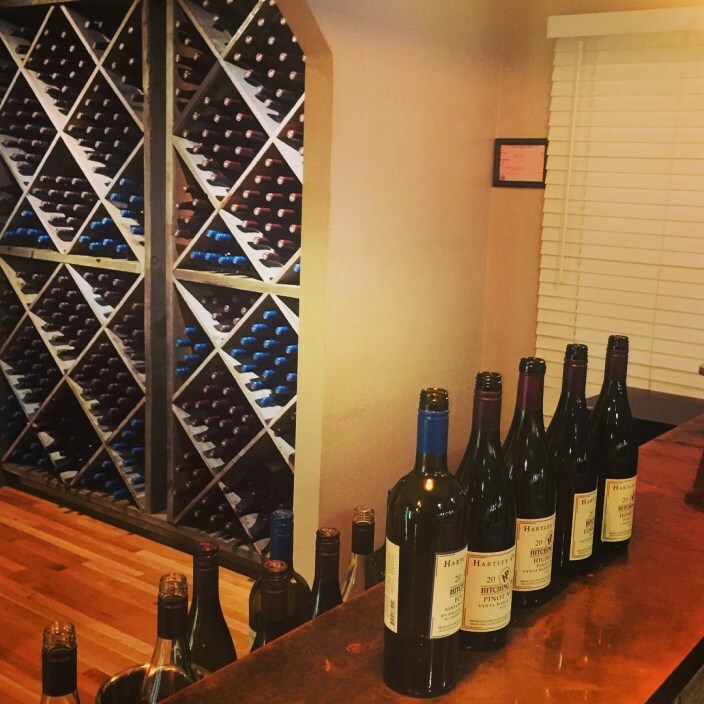 Hitching Post Wines also offers customized Private Winemaker Tastings with Gray Hartley and Frank Ostini for $60 per guest (by appointment only). 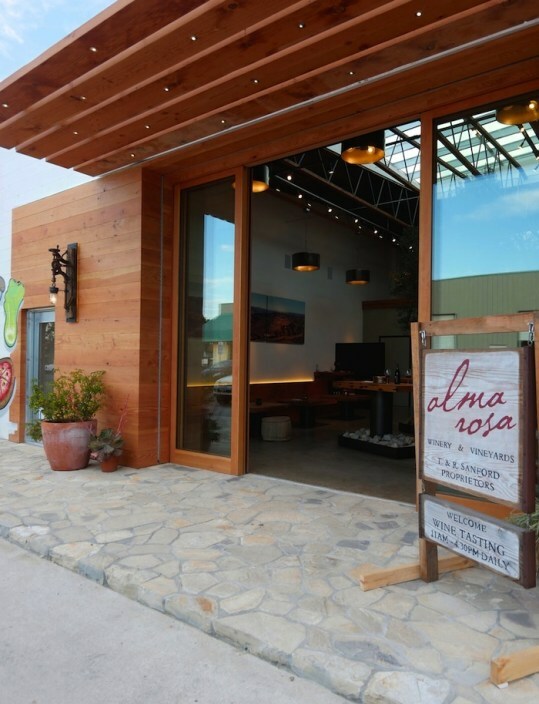 A sign welcomes visitors to the new Hitching Post Wine Tasting Room. The other beauty of this location is easy access to Hitching Post 2’s Santa Maria Style BBQ food pairings. 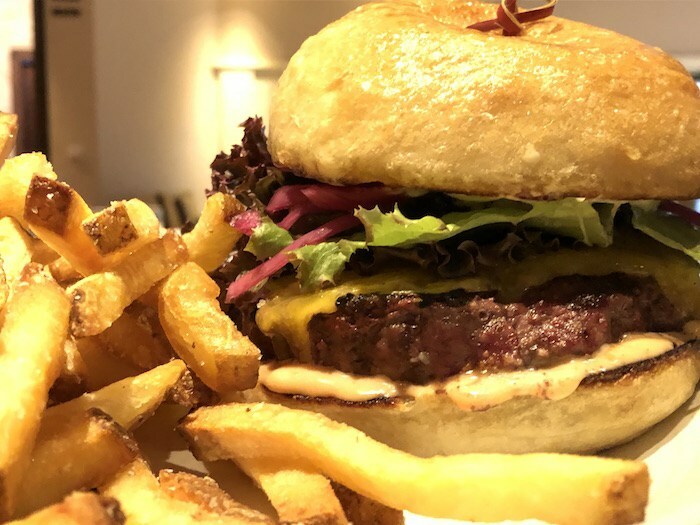 Classics from the restaurant include HP Burgers, Triple-Fried French Fries, Santa Maria BBQ Artichokes and Grilled Corn Quesadillas. Coming soon, the public will experience an expanded lunch menu served from a refurbished 1970s Vintage Airstream trailer, relocated from Seaside, Florida, and converted into a first-class Santa Maria BBQ kitchen on wheels. In the coming months, look for the phase two restoration of the rear building into a public wine bar with an enclosed patio overlooking the river with mountain views and a natural stage, ideal for live performances. The classic Airstream trailer and Hitching Post Santa Maria grills will offer a broader menu, cooked onsite surrounding by casual seating. 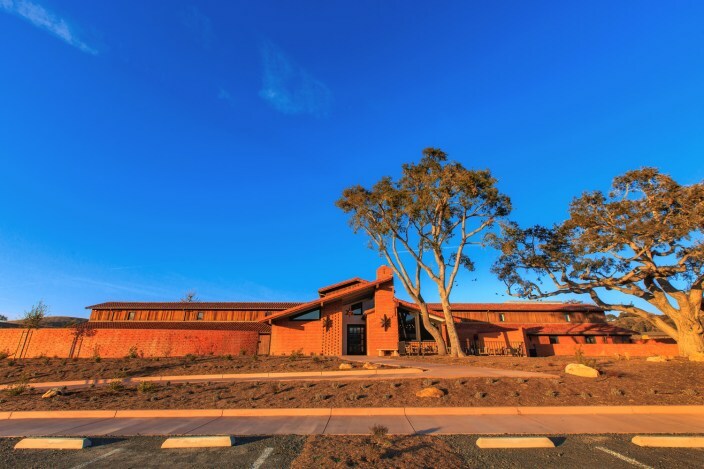 Also planned is a phase three restoration and remodel of the original barn that oversees the Santa Ynez Mountains specifically for private Hitching Post events. Inside the Hitching Post Wine Tasting Room, photo by Leslie Dinaberg. 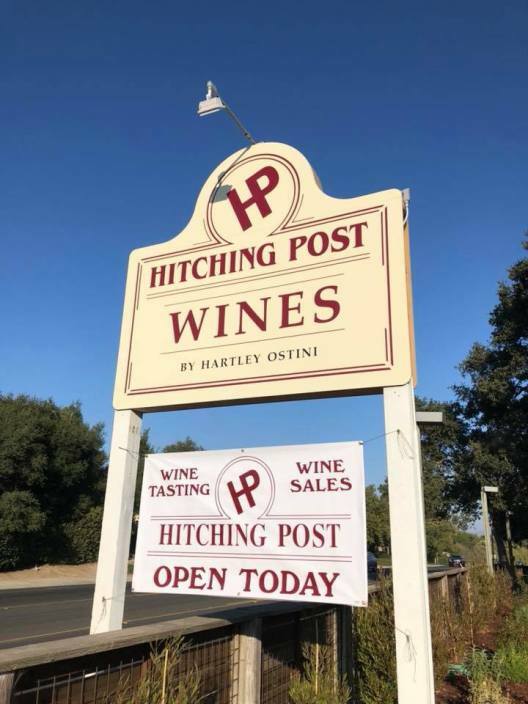 Hitching Post Wines is open Sunday – Thursday from 11 a.m. – 5 p.m. and Friday and Saturday from 11 a.m. – 8 p.m. Food service from The Hitching Post 2 is available from 11:30 a.m. until 2:30 p.m. daily, with limited cheese and charcuterie available for purchase in the tasting room. Hitching Post Wines is located at 420 E. Hwy. 246, Buellton. Originally published in Santa Barbara Seasons on August 31, 2018. It’s sure to be a wild party this weekend when Firestone Walker’s Wild Ale Facility in Buellton marks its fifth anniversary with a “Feral One” release party on Saturday, March 3. Barrelworks was established in 2013 after Firestone Walker’s wild ale program outgrew the main brewery in Paso Robles. It has since become known as a “cathedral of barrels” that produces an acclaimed variety of sour beers and hybrid ales under the watchful eyes of Richardson and Master Blender Jim Crooks. The festivities take place from noon to 3 p.m. on Saturday, March 3 at Firestone Walker Barrelworks (620 McMurray Rd., Buellton). Tickets include pre-purchased bottles of Feral One Batch #5; a “pig plate” to build your own tacos or sliders (pig roasted on site); live music by The Ragged Jubilee; tastings of rare wild ales and barrel-aged beers; plus light bites while supplies last and a one-time 25% savings card good for merchandise and beer purchases (with exception of Feral One) that day. For more details and to purchase tickets for event, click here. Check out Santa Barbara Seasons Magazine‘s spring 2017 story, “Where the Wild Brews Are,” here. Originally published in Santa Barbara Seasons on March 2, 2018. Artist Felipe Molina will have his work on view at Standing Sun Wines in Buellton from Sept. 30-Nov. 30. Courtesy photos. Wine and art make a great pairing when Standing Sun Wines presents new work by artist Felipe Molina, who was recently inducted into the Album Art Hall of Fame for his Counting Crows album covers. The exhibition opens on September 30 at Standing Sun Wines, 92 Second St., D, Buellton, and remains on view through November 30. For more information, visit www.standingsunwines.com. Originally published in Santa Barbara Seasons on September 29, 2017. Cheers to our friends at Figueroa Mountain Brewing Company, which, in just six short years, has grown from a small production facility and taproom in Buellton to a six-taproom, four-brewery operation with distribution throughout California, Arizona and soon expanding to additional states. Figueroa Mountain Brewing Company is the fastest growing craft brewery on the Inc. 5000 list, and also recently joined the Pacific Coast Business Times’ 50 Fastest Growing Companies list for California’s Central Coast. Figueroa Mountain Brewing Company was founded by in 2010 father and son team, Jim and Jaime Dietenhofer. With a passion for craft beer, they set out to pay homage to the beautiful Santa Ynez Valley with handcrafted beer and hand-drawn artwork depicting the local landscape on their labels. There are currently six taprooms along the Central Coast of California. Excited about the future, the fig team is going BIG for its annual celebration, with a 6th Anniversary Party on Saturday, November 26 from 1-9:30 p.m. at the Buellton taproom (45 Industrial Way, Buellton). Courtesy Figueroa Mountain Brew Co. Admission is free and guests can take advantage of the 6th Anniversary bottle release a day before it goes on sale at the other five taprooms and in select local retailers. Enjoy contests, food for purchase, special mini-events and live music at their flagship brewery and beer garden. In addition, this year’s special bottle release is Figueroa Mountain’s 6th Anniversary Grand Cru Ale aged in apple-pear brandy, grape brandy and whiskey barrels and sold in 22-ounce bottles. Special holiday gift-packs will also be available with two 6th Anniversary bottles and a 6th Anniversary t-shirt. In addition to the food items for sale in the beer garden from Figueroa Mountain’s new Buellton taproom restaurant, there will be several special offerings throughout the day. Unlimited cask tastings will be sold for $10 per wristband with four cask releases throughout the day. Wristband holders will also be eligible to win prizes such as a private beer pairing dinner for 10 with Chef Brian Champlin. Also available for serious beer aficionados is the 6th Anniversary Barrel Tasting & Pairing held in the upstairs mezzanine from 3-5 p.m.
“Our brewers will walk guests through a flight of four versions of the 6th Anniversary Grand Cru Ale,” explains Head Brewer of Buellton, David Traille. “We’ll have samples of each barrel followed by the final blend for comparison.” Each taste will include a small bite of food that pairs with that particular sample. For $75 per ticket, guests will also receive a 6th Anniversary t-shirt and a 22-ounce bottle to take home with them. Tickets can be purchased at http://fig6th.nightout.com. Originally published in Santa Barbara Seasons on November 11, 2016. Cask beers take the spotlight next weekend when Figueroa Mountain Brewing Co. hosts the Real Ale Invitational lunch and festival on Saturday, October 25 from 1–4 p.m. at Figueroa Mountain Brewing Company’s flagship brewery and taproom, 45 Industrial Way, Buellton. The company’s cask program is run by head brewer of Santa Barbara, Kevin C. Ashford. Each taproom boasts a cask engine for new releases every “Firkin Friday” featuring many of their standard ales. These casks contain high quality ingredients such as hops, spices, coffee, cacao, and even locally grown fruits. Real Ale, or cask beer, is “beer that is unfiltered which undergoes a secondary fermentation and conditioning process. This process naturally carbonates the beer to a softer texture. It is poured directly from the cask—essentially a 10.8 gallon stainless steel barrel—without additional Nitrogen or Carbon Dioxide assistance,” Ashford explains. For those beer lovers that want a more intimate experience paired with food, a limited number of tickets will be sold for a Real Ale Lunch prior to the Invitational from 11:30 a.m.–1 p.m. There you will meet the cask masters who have perfected the skill of brewing real ale while enjoying a four-course meal prepared by Beto Huizar, executive chef of Beto’s Place, a new restaurant slated to open in Fig Mtn Brew’s Buellton taproom later this year. Tickets to the lunch are $75 and include admission to the Invitational. For more information about Figueroa Mountain Brewing Company’s Real Ale Invitational, please visit www.FigMtnBrew.com/RealAle. Originally published in Santa Barbara Seasons on October 17, 2014. Scarecrow Fest, Grand Prize Winner, Buellton Valley Pets. Photo by Tenley Fohl Photography. The beginning of Solvang’s 5th Annual Scarecrow Fest coincides with the Santa Barbara Wine Country Celebration of Harvest Weekend, then there are numerous fall activities planned in the Santa Ynez Valley/Santa Barbara Wine Country, spread throughout the month. -The amazing scarecrow contest, where Solvang businesses, organizations and, as a new facet to this year’s contest, Solvang residents, will participate in the contest by featuring a scarecrow of their own creation, posted at their location. You can vote via ballot boxes scattered about the city, for scarecrow winners in six different categories: “Best Scarecrow in Motion,” “Best Use of Recycled Materials,” “Best Use of a Business Theme,” “Most Danish,” “Spookiest” and “Most Humorous.” Ballots are available at the Solvang Visitors Center and at select Solvang businesses, and feature maps to direct voters to each of the contest’s scarecrows. Once a “Best Solvang Scarecrow” winner has been chosen, it will be entered into the Santa Ynez Valley-wide competition with the respective winners from Buellton, Los Alamos, Los Olivos and Santa Ynez, to determine the “Valley’s Best Scarecrow” bragging rights. Solvang Scarecrow Fest, Best of Solvang Lucas & Lewellen, #1 Judges Choice Winner. Photo by Tenley Fohl Photography. –The October installment of Solvang’s Third Wednesday, to be held on October 15, which will feature a “Fall Frolic Block Party” at the town’s “West End” including live music, free treats, a local business-supporting “Cash Mob” and free admission to the Wildling Art Museum. –The Oct. 15 “Fall Frolic,” Lemos-sponsored doggie costume contest and parade kicks off at 5:45 p.m., with prizes – $20 Lemos gift certificates – being awarded for best costumes in three categories: “Funniest,” “Scariest” and “Most Original.” To enter the costume contest, human handlers should show up in front of Lemos (1511 Mission Dr.) by 5:45 p.m., with their animal counterparts. Along the “parade” route, a handful of Solvang’s West End businesses will be upping the “free” and “food” antes including Wandering Dog Wine Bar, (1539-C Mission Dr.) which will be offering gratis Rosemary Spiced Nuts, as well as free cider and nibbles in front of Kandra’s Beads (1539-A Mission Dr.). -The 21st Annual Haunted House and Street Fair, which will thrill visitors with food, fun and spirits, on Oct. 30-31. The Haunted House and Street Fair, to be held at the Solvang Festival Theater (420 2nd Street), will include a “Trunk or Treat” candy-palooza among other tasty and spirited delights. Additional information is available at www.solvangthirdwednesday.com. Solvang Scarecrow Fest, Best Use of Recycled Materials, Waste Management, courtesy photo. Originally published in Santa Barbara Seasons on October 8, 2014.